The Centers for Medicare and Medicaid Services (CMS) are replacing all Medicare identification cards. The new cards remove your Social Security Number and replace it with a new, 11-digit number that is unique to each beneficiary. This helps protect against identity theft, and makes it much harder for scammers to commit Medicare fraud. Medicare fraud wastes lots of money each year and makes health care costs higher for everyone. In fact, beneficiaries in Delaware, the District of Columbia, Maryland, Pennsylvania, Virginia and West Virginia began getting their new cards in May. Cards just went in the mail for enrollees in Alaska, California, Hawaii, Oregon, and the territories of American Samoa, Guam and the Northern Mariana Islands. All cards will be mailed by April 2019. A processing fee: A caller contacts you claiming to be a Medicare representative, asking for a processing fee or other credit card payment before you can receive your new Medicare card. 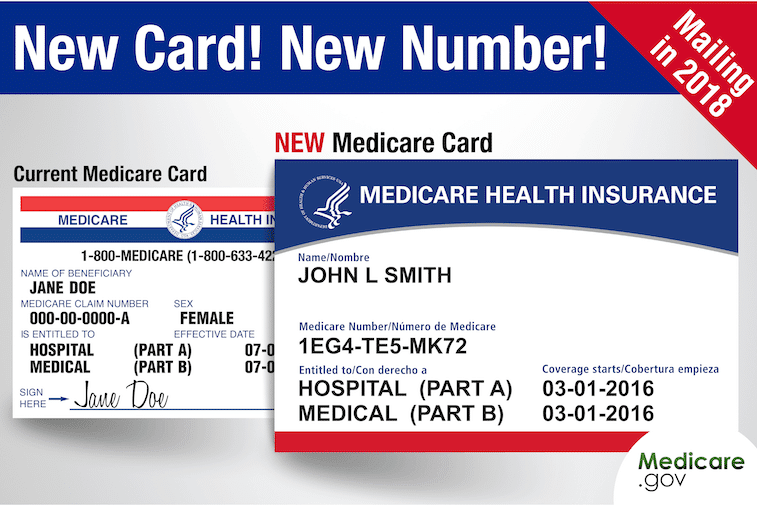 There is no charge for the new Medicare cards, and they will all be mailed free of charge between now and April 2019. A temporary card: A caller contacts you claiming to be a Medicare representative, asking you to purchase a temporary card for between $5 and $50. You do not need a temporary card. You can continue to use your current card until December 31, 2019. You can view states that are currently receiving cards at medicare.gov/newcard and receive an alert when your state is being mailed. Verifying personal information: You receive a call asking you to verify your personal information before your new card can be mailed, including your Social Security number, address, or other information. Medicare will never ask you to disclose personal information to get your new card. It will be mailed automatically. To verify that they have your correct address, you can contact the Social Security Administration at socialsecurity.gov/myaccount or 1-800-772-1213. A request to mail in your old card: A scammer asks that you mail in your old Medicare card. You should never give your card to anyone. Once you receive your new card, your old card should be destroyed. Keep your card secure, as well as your Social Security card. Don’t share the number with anyone other than those you absolutely have to for healthcare coverage – doctors, pharmacists, other healthcare providers, your insurers. If someone calls and asks for your Medicare information, hang up. Medicare will only call you if you’ve called them and left a message or a call has been pre-arranged. Always check your statements carefully and log onto MyMedicare.gov to investigate more closely. Report anything suspicious to 1-800-MEDICARE (1-800-633-4227). Protect your Medicare card like it’s a credit card, and don’t be afraid to ask questions. Educate yourself about Medicare and Medicare fraud, and protect yourself from becoming a target. With knowledge and awareness, you can save yourself lots of headache and financial heartache later.